“MYSTERY” is the one word to describe the two big things to happen in the life of Fr Vince Hobbs – priesthood and the Catholic Charismatic Renewal. That’s the word Fr Vince would use anyway. When asked why he became a priest, the 83-year-old said: “That’s a mystery that you can’t give a total answer to, because it’s a matter for God’s grace. He’s been a priest for 58 years and is retired at Labrador, on the Gold Coast. Some people may say he was the one who started Catholic Charismatic Renewal in Queensland 48 years ago, but Fr Vince would have nothing of that. “I didn’t start it,” he said. 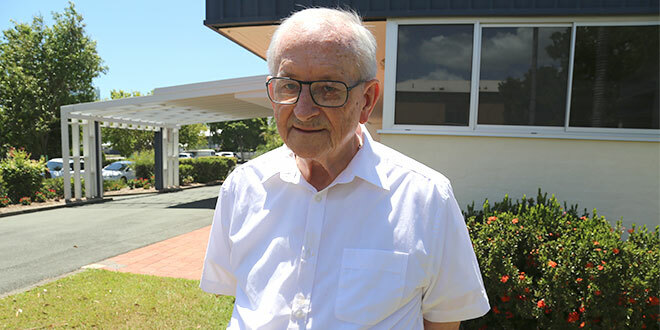 As that CCR group, the oldest in Queensland and second-oldest in Australia, approaches its 48th anniversary, it continues to meet each week for prayer and monthly for healing Masses. Thousands of people have experienced the blessings of the group at Bardon, in Brisbane’s inner west, and witnessed healings. Fr Vince counts his own blessings for having been part of the group, and in the past year has experienced the power of healing in a special way. He’s had a year battling cancer – advanced Hodgkin lymphoma. “I was on chemotherapy and then radium therapy, and I’ve just come off it,” he said. Fr Vince said he felt God’s healing through the CCR group. “You know, I still had to have all the chemotherapy, and so forth, but I had the support … I had a sense of being healed underneath it all, of peace, I think, (that) was a big thing,” he said. “I was praising God for whatever good he was bringing out of it, and so I was able to live in that peace that God was bringing good out of this. That’s meant a lot. “And all the support … People have said to me, ‘You had a lot of prayers …’ and that’s true. “And even down the road at the Anglican church, they prayed for me – for healing. “I’m in remission – that’s as good as you can be, I think. But healing comes in many forms through CCR. “We pray,” Fr Vince said. “Every month, we have a healing Mass, and everybody’s invited to come forward to receive a prayer, and we have teams or couples of people up the front who pray over whoever comes up and wants a prayer … for anything at all – personal, relational, physical, mental, spiritual … whatever, we pray whatever’s God’s perfect will for them. “We can’t control what happens with prayer …,” Fr Vince said. “It’s part of the life… It gives new life to the group. I think ­ praying for healing and praying in tongues helps us to worship. Catholic Charismatic Renewal’s national website describes CCR as “a spiritual movement within the Church that emphasises the availability of the power and the many gifts of the Holy Spirit in the life of every believer, and the need for a personal relationship with God through Jesus Christ in order to live life to the fullest”. It’s that “personal relationship” that is key for Fr Vince. He said that was what it was all about when the CCR Bardon flourished from humble beginnings. “I’d just started to read about (CCR or ‘Catholic Pentecostal Movement’ as it was called then) and it was catching my attention – what it was doing in the United States,” he said. Fr Vince said Divine Word Missionaries Father Frank Gerry had visited a CCR group in the US so he invited Fr Frank to come to Bardon parish, where Fr Vince was assistant parish priest, to tell others about the movement. They met with a few people in the parish hall. “And it could’ve been just a discussion group – it would’ve been an intellectual trip … but somebody suggested we stand up and sing a hymn,” Fr Vince said. “We stood up and sang, and then prayed. And people kept coming back, and the word began to spread, drawing more and more people, until there were too many for the hall. The group had to start gathering in the church instead. Fr Vince was convinced of the renewal of faith that was happening through the CCR group, and he sought and was granted permission from Archbishop Patrick O’Donnell for the group to continue. And Fr Ray Lyons, who was Bardon parish priest at the time, was also encouraging. “(He) gave his approval,” Fr Vince said. “He was the parish priest, and he defended us from many critics. Some of the critics dismissed the Charismatics as “happy clappers”. “That was one thing, just as if it was all surface …,” Fr Vince said. For those drawn to CCR, their experience was anything but a “surface” thing. “What it did was, it didn’t change Catholic doctrine, but (changed) people … It gave them a new level of faith, especially in relation to the person of Jesus,” Fr Vince said. “That was the heart of it all – a personal relationship with Christ. “And people learned to grow, and we pray in tongues, like they all do in all the groups, and sang, and that was a real blessing and a gift for people and a new dimension for them. “That (praying in tongues), again, is rather controversial for some people. Fr Vince said CCR “took us to the heart of the Gospel”. “And people loved Scripture then; they read the scriptures and the scriptures came alive,” he said. Personally, it opened a new dimension of priesthood for Fr Vince. “Before, I was very much living out of my role, my official role,” he said. “I was a functionary in a way, but I learned to relate to people as brothers and sisters in Christ, and to share personally. Fr Vince said the spiritual riches he encountered were life-giving for his ministry. He’s happy to be exercising that ministry still, helping out by celebrating Masses at St Joseph the Worker Church, Labrador. Unfortunately, though, he’s had to give up driving to Brisbane to be with the CCR group at Bardon. “It would be good if a priest volunteered to be a chaplain to it at the moment, I think,” he said.